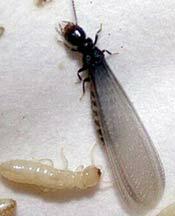 When termite colonies reach maturity in 3 to 6 years, winged reproductives, called "alates," are produced. Similar in appearance to flying ants, termite swarmers are dark brown with thick, 3/8-inch long bodies, straight antennae and long, gray wings of equal size that are nearly twice their body length. Ants, which also exhibit swarming behavior when expanding their colonies, have longer forewings than hind wings, elbowed antennae and a pinched waist. A free pest inspection by an Allison Pest Control expert can determine whether you have a termite or ant problem and provide the most effective pest control solution. Climbing from their underground nests to the surface from March to May, termite swarmers are often seen milling around the ground in large "pools" near building foundations or in lawns before pairing off and taking flight to expand the colony. Males die shortly after mating while females shed their wings and burrow into the ground to begin a new colony. A pool of swarming termites is often the first indication of a termite problem and a certain sign of a large, active termite infestation in the immediate vicinity. If termites swarm indoors, discarded wings may be found littering windowsills or entrance areas, another sure sign of termite activity. Poor fliers, termite swarmers often land nearby and establish satellite colonies. It is common for multiple termite colonies to be active in the same area and be attacking the same structure. Because only mature, well-established termite colonies swarm, significant structural damage may already have occurred by the time termite activity is discovered. An experienced termite exterminator like Allison Pest Control should be called immediately to prevent further structural damage. Voracious wood eaters, termites eat the softer internal wood fibers from the inside of wood, leaving a thin shell of wood or paint around the hollow core. While usually discovered by the presence of swarmers, termite infestations are sometimes detected when this shell is inadvertently punctured during building maintenance or cleaning activities. With a unique caste system in each colony, each type of subterranean termite has a special role to play in the creation, growth, and maintenance of the termite nest. Reproductives. These are the "kings" and "queens" of the colony and the only termites in the group that actually reproduce; creating all the other castes. Queens can measure up to 1/2 an inch long, dwarfing other termite types in the colony. They are efficient egg-laying machines and can produce up to 2,000 eggs per day. With a life expectancy of more than 20 years the queens are the life blood of the existence of any colony. They produce all colony termite type variations and are tended by worker termites. Kings on the other hand are about the same size as other termites in the colony; about 1/8 of an inch long. They have a similar life expectancy to queens and will be found in the center of the colony near the queen. Soldiers. Soldier termites are defenders of the colony which rests deep underground. These soldier termites are about one quarter of an inch long with "armored" heads that extend as long as their body. Using a special sticky fluid they create and extrude, they trap invaders and then crush them with their strong mandibles. If you disturb a termite colony, the soldiers will be most visible as their role is to protect the colony. Workers. 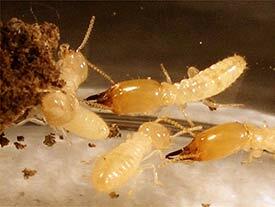 Worker termites are the most numerous in any colony. They are the food providers, nursery tenders, and keepers of the colony.They measure about one eighth of an inch long (the size of a match head), are creamy white, have soft unarmored bodies, and are blind. They work 24 hours a day taking care of the nest, grooming each other, creating new colony passages, repairing nest damage, feed the colony members, care for the queen and kings, and attend to termite young called nymphs. Workers digest the cellulose from the wood taken from your home, digesting it and then excreting or regurgitation the material as food. Swarmers. Produced when a colony grows too large for its food resources, these special winged reproductives called alates are produced in large quantities. These long-winged secondary reproductive termites will leave the colony and begin to swarm outside typically as early as March in New Jersey. Alates have functional eyes (versus the workers and soldiers which are blind) and two pairs of long, oval gray wings. Measuring about 3/8 of an inch long, swarmers are brown in color and larger than worker termites. They are often confused with flying ants. Eastern Subterranean Termites build their nests deep in the ground between the frost line and water table. Unlike carpenter ants that live in wood, termites require constant moisture and must regularly leave the wood on which they feed to return to the moist ground where they nest to replenish lost fluids. As termites chew tunnels through wood, these wood-devouring insects pack the tunnels with moist soil to maintain the high humidity necessary to keep their unprotected bodies from drying out. When forced to cross a dirt-free area such as a concrete wall during foraging, subterranean termites mix dirt with saliva to build "mud" transit tunnels across bare areas. Intact mud tunnels climbing up the outside walls of buildings, a common indication of Formosan termite activity in southern states, are rarely seen in New Jersey; but traces of mud may be evident on basement floors in active termite areas. Attracted by moisture and damaged wood, subterranean termites can invade buildings through tiny cracks in damp foundation walls or via poorly-ventilated crawl spaces, anywhere direct contact occurs between dirt and a structure. Termites can also attack buildings from overhanging tree limbs to nest in attics. In addition to destroying structural timbers, framing and finishing wood, termites can cause irreparable damage to insulation, swimming pool liners and filtration systems. While they prefer to feed on structural timber like Douglas fir, termites will also eat paper, cotton and the roots of trees and bushes, killing the plants. Effective elimination of a termite infestation in your home or business requires the expertise of a pest control professional with demonstrated experience in termite extermination. Allison Pest Control professionals have the expert knowledge, technical expertise and proven experience to locate and destroy termites successfully. Allison Pest Control's residential and commercial pest control plans can rid your home or business of structure-damaging termite infestations and keep termites from coming back.